Weight for It is a duel minigame in Mario Party 7. 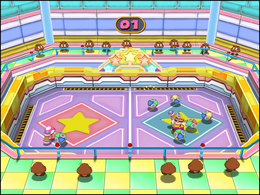 The minigame's name originates from the saying "wait for it" and has a similar concept to that of Goombrat Combat from Mario Party 10. The first player knocks a ball past the rival, surprising him/her. Then, he or she walks to the center of the left platform. The goal of the minigame is that the two players need to send metallic balls at each other by whacking them with their hammers. If one player knocks a ball into the opponent, that opponent will be stunned for a few seconds. Once time is up, the player who has the most balls on his or her side loses. There are seven weights, ensuring that a tie is nearly impossible unless the players do nothing. In the event of a tie, however, the platform the two players are on will split in half and fall into the pit, taking the two players and the balls with it. Rules – "Hit balls with a hammer to roll them toward your rival. The player with the least amount of balls wins!" Advice – "Hit the balls! Quickly! It's easy and fun!" Hanmā de uchikaese! Hit Back with a Hammer! This page was last edited on November 25, 2017, at 19:55.